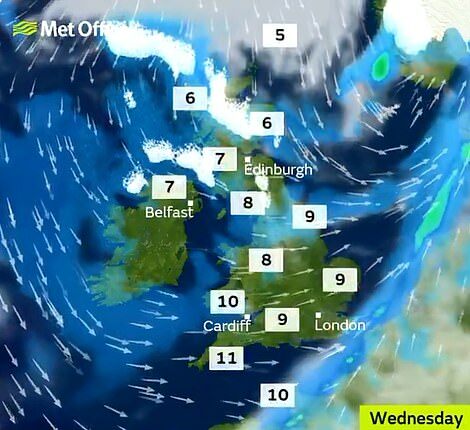 Snow could fall ‘almost anywhere’ in Britain by the end of the month as temperatures plunge to -10C this week. 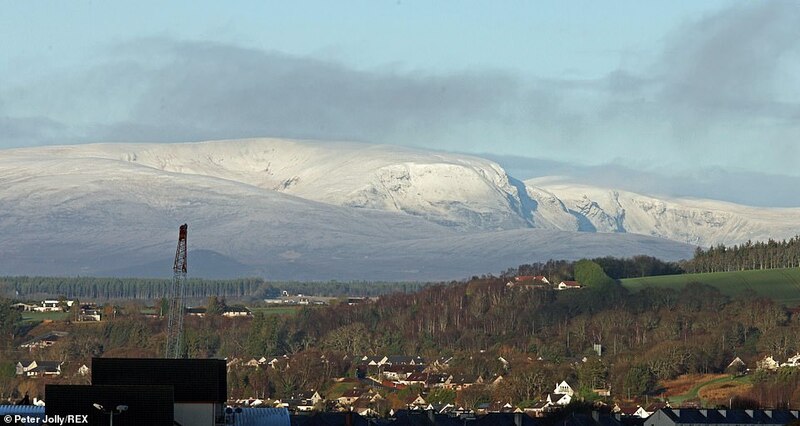 The Met Office has warned the white stuff could settle over the mountains of Scotland today – before becoming more widespread from the start of next week, especially across northern and central areas of Britain. After a mild weekend that saw the mercury hit 13.2C (55.8F) in Shropshire yesterday, temperatures will fall well below freezing by Wednesday – dropping to -5C (23F) or even -10C (14F) in some patches of Scotland. 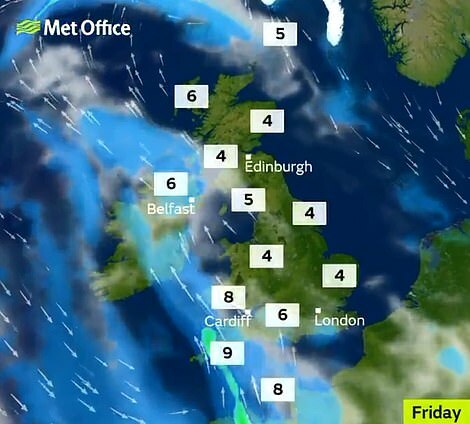 Snow could also fall in western parts of the UK by Friday, before it travels east the next day – with rain possibly turning to snow ‘almost anywhere, but particularly across northern and central areas’, according to the Met Office. 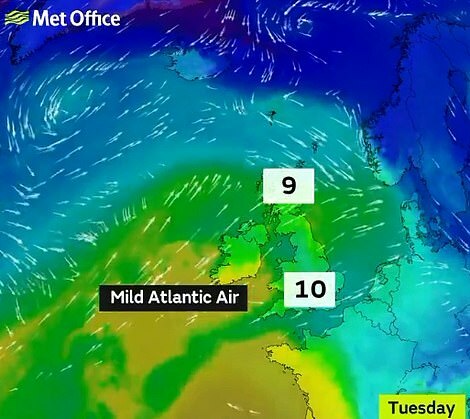 Forecasters have also warned of frosts becoming ‘widespread and severe’, before an ‘increased likelihood of cold weather being established across all of the UK’ towards the very end of January and start of February. The average national temperature for January is 3.5C (38.3F), and the coldest night of winter so far was January 3, when Braemar in Aberdeenshire recorded a low of -10.5C (13F). 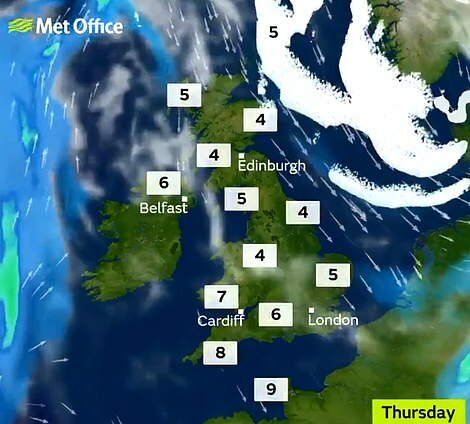 A Met Office spokesman said: ‘There will be colder spells and there could be a little bit of winteriness in the north, but nothing too exceptional for this time of year. As we head towards the later part of January it will turn colder. 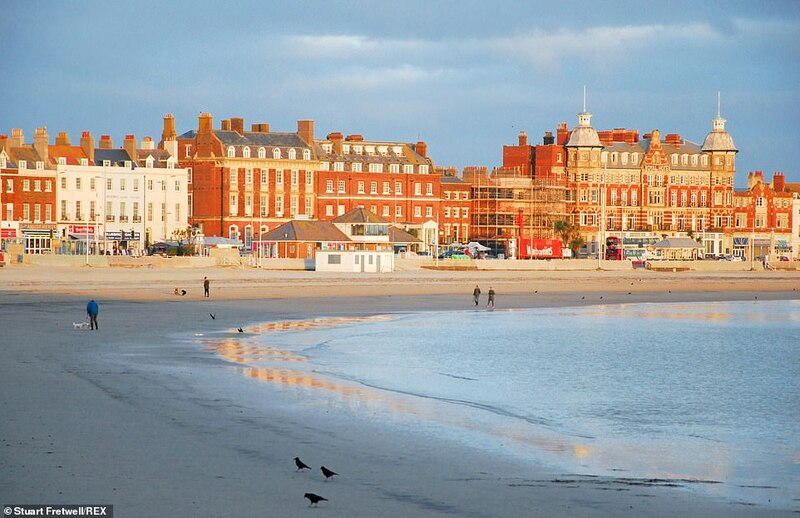 TODAY: Sunny spells but with a few showers. Cloud and rain spreading into the west. Average temperatures for most, but staying cold in the North East. Highs of 9C. TOMORROW: Patchy rain in the West but brighter in the East. Heavy rain in North West Scotland. Highs of 10C. WEDNESDAY: Rain clears, but turning colder with sunshine and showers – and wintry on hills. Highs of 11C. THURSDAY: Plenty of dry and sunny weather to come, with wintry showers in the North East. Highs of 8C. FRIDAY: Staying bright but cold for most areas. Rain or snow possible in the west. Highs of 9C. 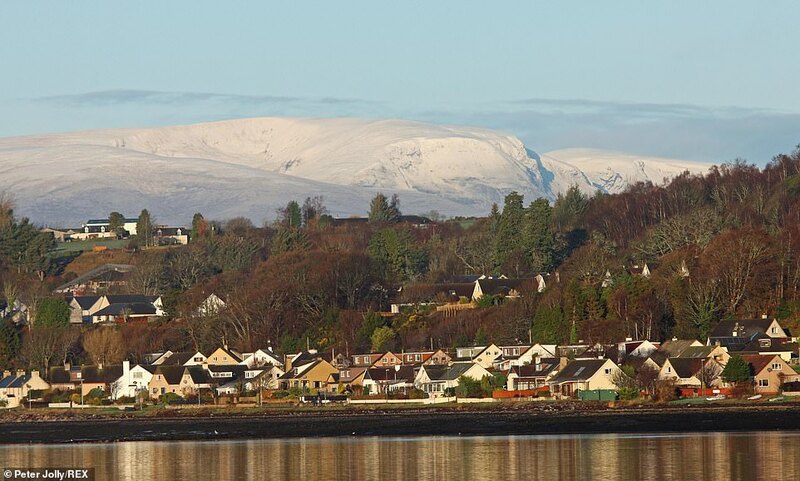 Forecasters have warned already this month that the same weather patterns which sparked the Beast from the East – and brought freezing temperatures and heavy snow last winter – could return this year. 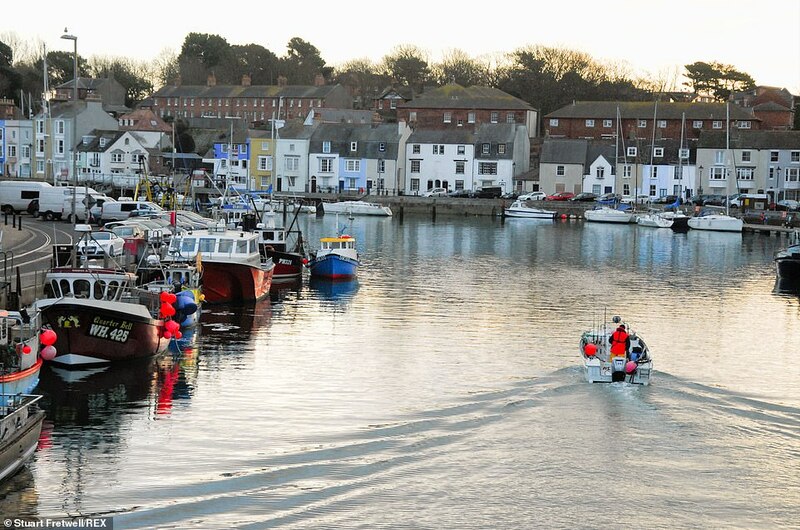 The Met Office said sudden stratospheric warming had appeared around Christmas, when there was a sharp increase in the temperature over a couple of days. 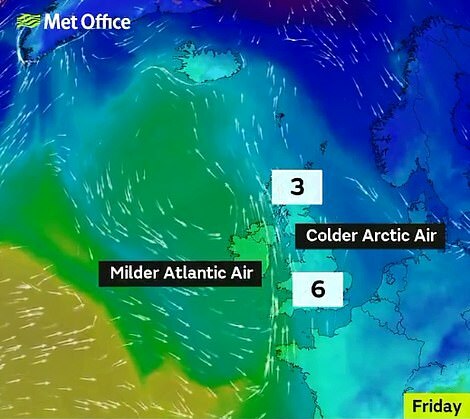 When this happens in the Arctic it can lead to a rush of cold air blowing eastwards across Europe a few weeks later, bringing much cooler temperatures to the continent. 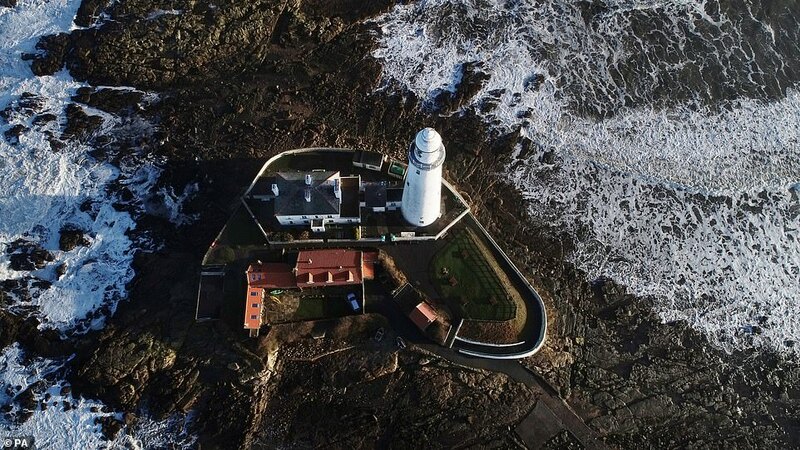 The Met Office said this is what caused the Beast from the East early last year – an icy blast of freezing Siberian winds which brought freezing temperatures and heavy snow to much of the UK. 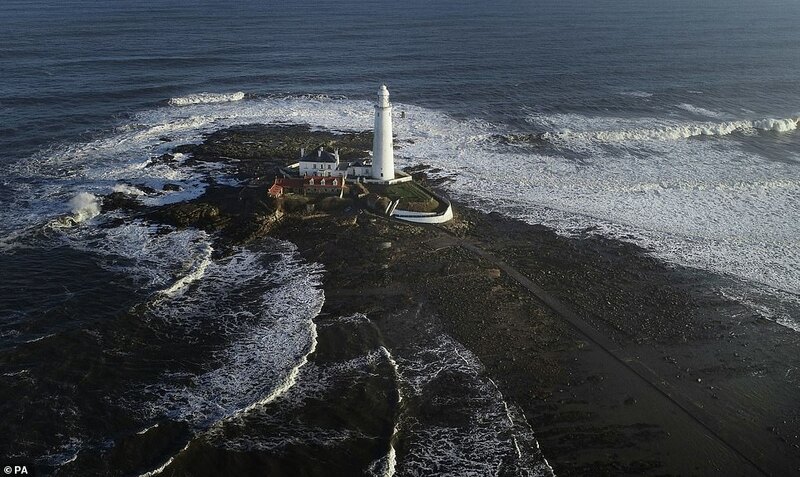 But forecasters said while Britain being hit by a new Beast from the East could not be ruled out, the forecast so far suggests the country will see stable conditions. 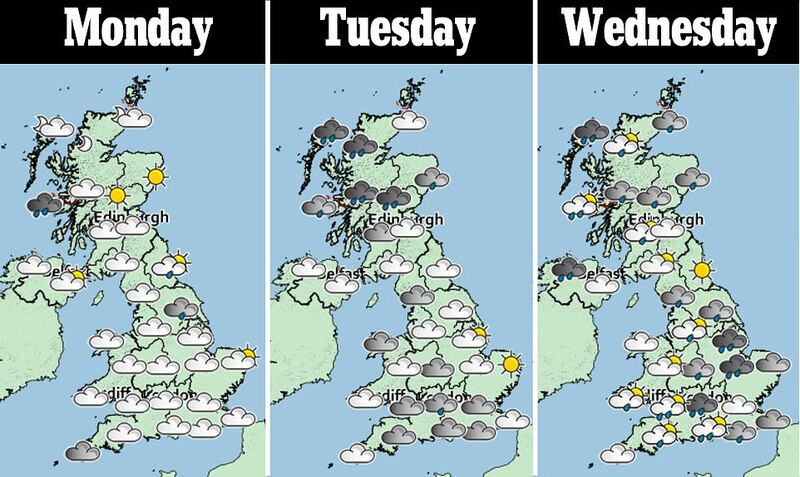 What is the Met Office outlook for the next three weeks? It will be mostly settled for a time on Friday, especially in the east, before thickening cloud and outbreaks of rain, perhaps with some hill snow, try to move eastwards later, with strong winds. The rain and hill snow will make further eastward progress on Saturday, perhaps with northeastern areas staying dry. 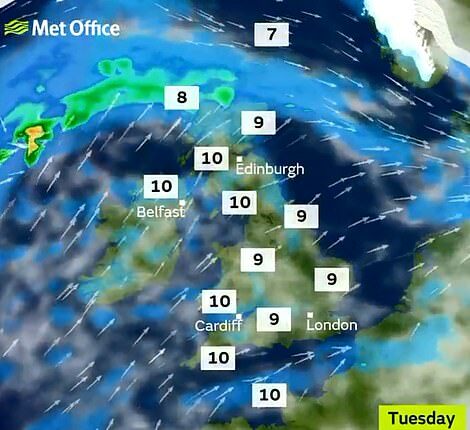 Thereafter, it looks set to remain mainly cold, unsettled and sometimes windy, with gales possible in the north. Any milder spells will tend to be brief, and associated with longer spells of rain. The rain could turn to snow almost anywhere, but particularly across northern and central areas, especially later in this period. Some drier, brighter spells are likely, perhaps with snow showers, especially in the east. During such spells, frost could become widespread and severe. For the end of January and into early February, there is an increased likelihood of cold weather being established across all of the UK, with temperatures continuing a downward trend to become cold or very cold. This would bring a greater risk of snow, ice and widespread frost, particularly across northern parts of the country. However, there remains uncertainty over the extent of the cold weather and how long it will last, and it is still possible that some milder and wetter interludes will intersperse this generally cold period, especially in the south. Magic mushrooms are thriving abundantly in the UK’s fields due to the mild winter weather, experts say. The psychedelic, naturally-occurring class-A drug has been found growing in large numbers across Staffordshire and Shropshire – presenting a headache for both foragers and police officers. 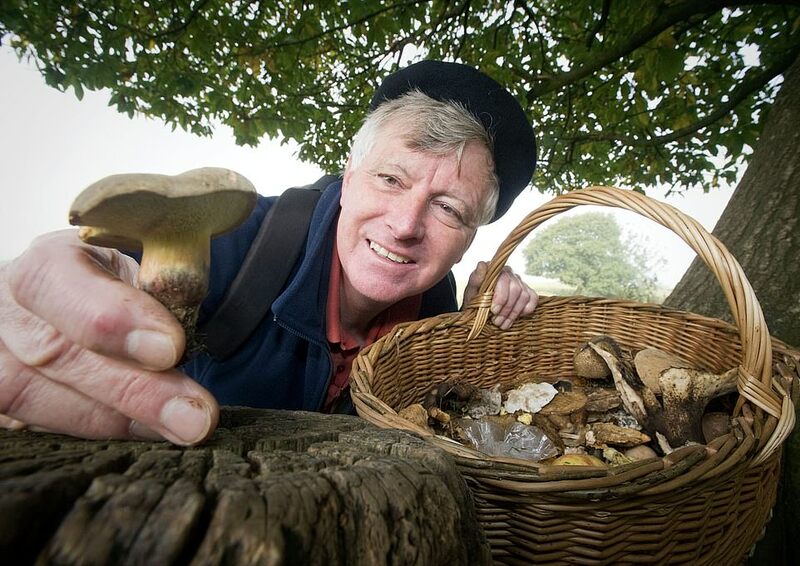 They are advising the inexperienced to avoid hunting for mushrooms in case they unwittingly stumble upon a crop of Psilocybe semilanceata, as they are known scientifically. 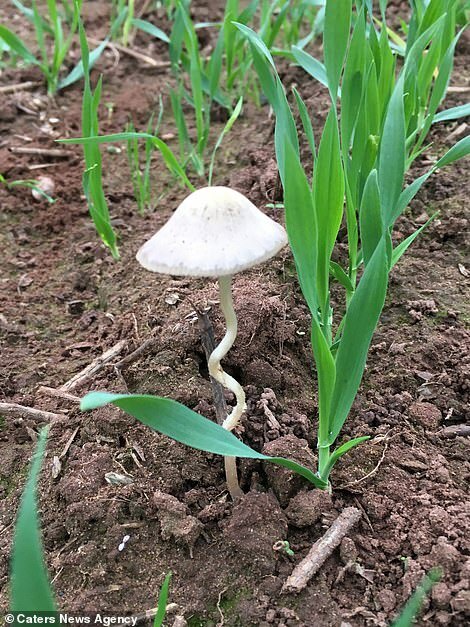 Normally magic mushrooms – which grow on grasslands and pastures grazed by sheep due to the nutrient-rich manure – are long gone by this time of year, but because of the mild wet weather they are still proliferous. 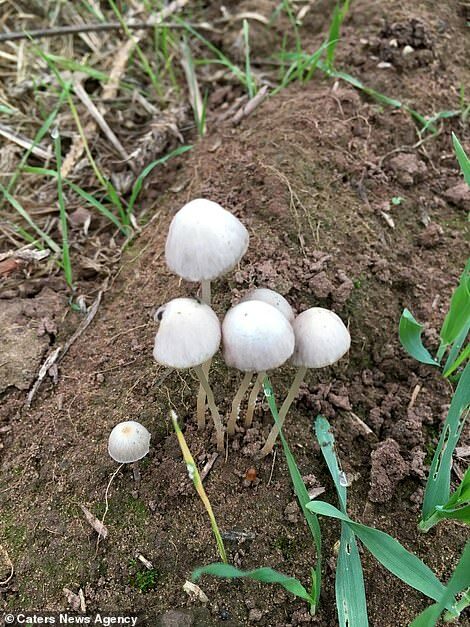 Jane Traynor, from the Staffordshire Fungi Group, said: ‘Psilocybe semilanceata are quite common and you do find quite a lot of them around Staffordshire. We haven’t really had a heavy frost yet which is what usually kills them off. Psilocybe semilanceata contain the psychoactive ingredient psilocybin and they fruit to produce their mushrooms at below 15C (59F) in the day and 10C (50F) at night, with the first freezing temperatures heralding the end of the season. They became popular in the 1970s as a legal alternative to LSD (Lysergic acid diethylamide) but they were banned in 2005 because of their psychoactive effect. Some varieties of magic mushroom look like red and white spotted toadstools while others have a brown cap. They are all have significant hallucinogenic qualities and are easily mistaken for other poisonous breeds of fungus which can cause serious harm to health. The mushrooms are illegal to possess, cultivate, transport or sell in the UK, but it is not an offence for them to be grown on your land as they live in the wild. 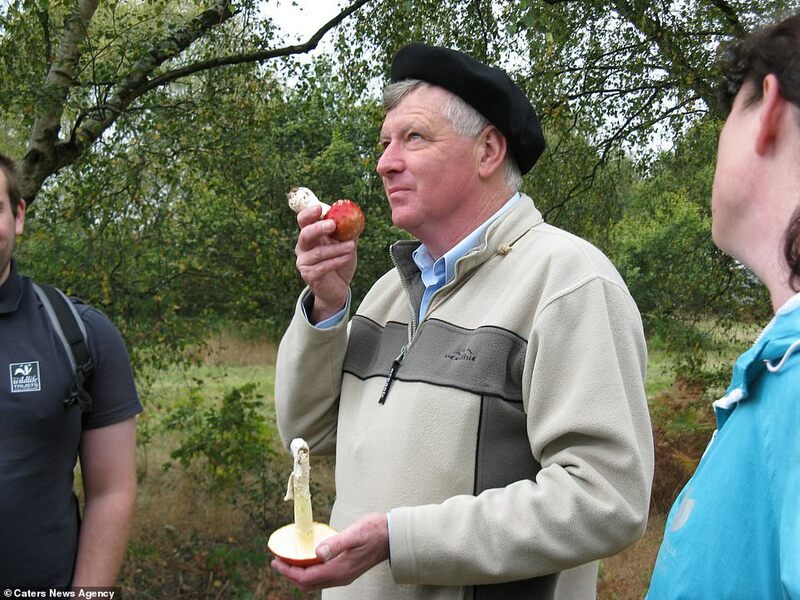 But John Hughes, a fungi expert at Shropshire Wildlife Trust, said the flurry of magic mushroom growth also signifies a negative – global warming. He said: ‘Something in the air this winter is bringing magic mushrooms above ground. The autumn has got longer. It used to be the case that by the end of October or November you would get fruits. ‘It tends to happen when it is warm and wet. It is in the very cold conditions that things change. I have been out in the woods and seen fungi out and about. ‘This year some things have grown well into December and beyond – it has been properly warm. It will stop when the weather changes and I would be surprised if we didn’t have cold snaps in the next couple of months.